Here’s a list of rules regarding table manners my dad created while I was a kid. Not like, as a formal list. He just snapped them at us verbally and we were supposed to remember them. Every time we went out to eat, at least one of these rules would get broken, and Dad would spend the whole meal telling us how embarrassing we were and how he was never taking us out to eat again. Then a few strangers would stop by and tell my parents they had never seen such well behaved children before, and he’d calm down a bit. This seriously happened every goddamn time we ate out. When you are finished eating, fold your hands and rest them on the table. When eating at the table, sit up straight, push your chair in as far as possible (this prevents you from spilling on yourself,) and keep your plate a reasonable distance from the edge of the table. Any spillage is proof this rule was violated. When ladies sit at the dinner table, they should cross their ankles. Regardless of what they’re wearing. If you already have food in your mouth, do not put more food in until the first bite is swallowed. No talking with your mouth full, regardless of how angry people get when you don’t answer questions because your mouth is full. When eating bread, tear off a small, bite-sized portion, and place it into your mouth. Bite-sized should be roughly one square inch of bread. If you would like butter, cut a serving-sized patty of butter off of the main stick of butter. Place it on your plate or the bread plate. Then butter a bite-sized portion of bread. When using utensils, start from the outside and work your way in. Silverwear at the “top” of a place setting is used for desert. Similarly to bread, all food should be cut into roughly one square inch sized pieces before being consumed. We are American, so we cut food the American style. Hold your knife in your right hand, fork in the left. Cut a bite-sized piece (one square inch) with your utensils. Set the knife down. Move your fork from the left hand to the right hand. Place the food into your mouth. Chew it, then cut the next piece. If you are cutting meat, go against the grain. Being in Europe is not a pass to switch to the European way of eating things. Forks should be held like this. Improper fork usage is an especially heinous violation of table manners, and can result in the steepest fines. Cut burgers and sandwiches in half before you eat them. Do not use a spoon to twirl pasta before eating it. You should be able to twirl it, and get it into your mouth politely, without the spoon. You should always have something to drink with dinner. If you don’t, and you start choking, it’s your fault you’re choking and you’re stupid. No singing at the table. Even during lunch, at home with just the family. Use low indoor voices only when at the table. Place utensils down gently on your plate when you aren’t using them. Peas may be eaten with either a fork or a spoon, but if you use a fork, you must scoop your peas. Don’t pierce them. 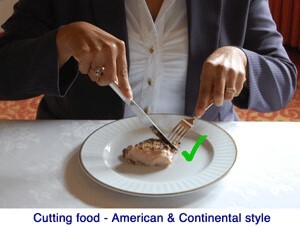 If you are unable to get a last bit of food on your fork, you may use a knife to push it onto the fork. never use your fingers. If you are offered one of those little dipping bowls, dip one hand at a time, then dry on the provided cloth. If you start coughing and can’t stop, excuse yourself and go to the bathroom immediately so other diners won’t be disturbed. Do not use a knife to cut desserts. Use the side of your fork. As always, pieces should be bite sized. Eat at a moderate pace. This was never actually defined, but I believe “moderate” was considered whatever pace Dad was consuming his food. If pizza is too hot to eat, or floppy, it should be cut. Last night at dinner I watched my father eat a hunk of steak three inches long. He didn’t move his fork to his other hand before eating it.